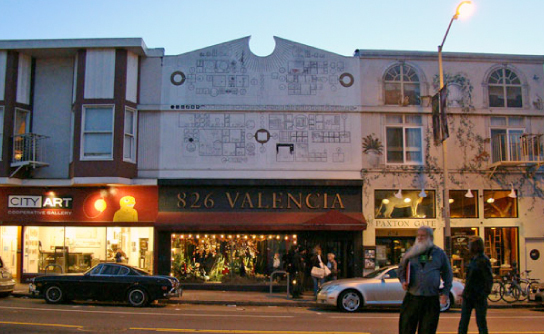 Named after our street location in the Mission District of San Francisco, 826 Valencia was founded in 2002 by educator Nínive Calegari and author Dave Eggers, who were looking for a way to support overburdened teachers and connect talented working adults with the students who could use their help the most. Because our space was zoned for retail, we needed to open a store. After briefly considering a hot dog stand, we looked at the ship-like surfaces of the stripped-down space, a former gym, and decided to open a pirate store instead. Behind the store we built a writing lab, designed to be a place kids would want to spend time, with a cozy reading tent, big work tables, and lots of books. Word spread quickly, and soon every chair was filled with students working on their writing with our trained tutors. We currently serve over 6,000 students a year thanks to our corps of over 1,700 volunteers. Inspired by the success of 826 Valencia, six more 826 chapters have opened in cities across the country; New York, Chicago, Ann Arbor, Los Angeles, Boston, and Washington, D.C. are each home to a unique branch of 826. Read more about the other chapters and find out how to get involved by visiting 826national.org. 2002 — We opened our doors in April and propped up a sandwich board highlighting our free programs. Students trickled in after their school day. In the very, very beginning there were more tutors than students, and many empty chairs. By summer we had a full schedule of workshops and published our first book, Starzen’s Booty. The pirate store began to establish itself as San Francisco’s only independent pirate supply store. 2003 — Our student numbers doubled by the end of the school year. Our five main programs were in full swing, steadily growing as partnerships with teachers and relationships with neighborhood families grew. We cut the red tape at the door of our most significant partnership to date: the Writers’ Room at Everett Middle School. Similar in theme to the writing lab at 826 (outfitted with the right blend of learning resources and sea-shanty sheet music), the Writers’ Room was established as a place for students to receive further individualized attention on their writing projects. 2004 — By January we had wrapped up our first annual Young Authors’ Book Project, a collaboration between 826, a local high school class, a distinguished mentor, and a host of tutors and writing professionals. Our first collection was called Talking Back and featured the voices of seventy-one students from Leadership High School offering passionate statements about teachers and the art of teaching. A second 826 opened in New York, modeled after our flagship writing center on Valencia Street. 826NYC began offering programming to schools in Brooklyn and New York City throughout the school year. 2005 — 826 chapters opened in Los Angeles, Ann Arbor, and Chicago. 2007 — Our fifth anniversary was a year-long celebration that culminated in a community festival, highlighting the strength and talents of our students, their families, and our cadre of dedicated volunteers. By the close of the school year, a new chapter of 826 was up and running in Boston, bringing our total to six 826 writing centers nationwide. We published our first hard-back book through the Young Authors’ Book Project. 2008 — In July of 2008, 826 National was officially formed as a separate legal entity. The work with our sister chapters was previously managed under the umbrella of 826 Valencia’s programming and Board of Directors, but by 2008, the growing national presence required more full-time staff and a focused national scope. This year 826 co-founder Dave Eggers was awarded the prestigious Heinz Award honoring — among other things — his commitment to young people through the 826 chapters. 2009 — Over 6,000 students participated in our programming during the school year. We erected the Young Writers’ Wall to showcase their hard work and spark. The exhibit rotates twice yearly and features five students with a portrait, some writing samples, and rich details that illuminate their personality. 2010 — The seventh 826 chapter launched in Washington, D.C. Our model had grown to serve over 22,000 students annually from coast to coast. 2012 — On August 26, 2012, we held our third annual Write-a-thon and at 8:26 PM, we ended the celebration with a toast to our first ten years of student programs. 2013 — In the fall of 2013, we launched a new after-school program at Buena Vista Horace Mann, a bilingual K–8 school on Valencia Street, to tutor third- and fourth-graders on their writing skills. 2014 — We debuted a brand new writing room at Mission High School at the start of the 2014 school year, and expanded our Buena Vista Horace Mann annex program to include third-, fourth-, and fifth grades. We also reached some publishing milestones, celebrating 10 years of the Straight Up News at Everett Middle School, printing the 50th issue of the Valencia Bay-Farer, our in-house student newspaper, and publishing the 20th volume of the 826 Quarterly.